Several people have described teardrop camping with their children - generally by putting them in a tent. Perhaps some might prefer to have space for their children inside their trailer, particularly when they are younger. 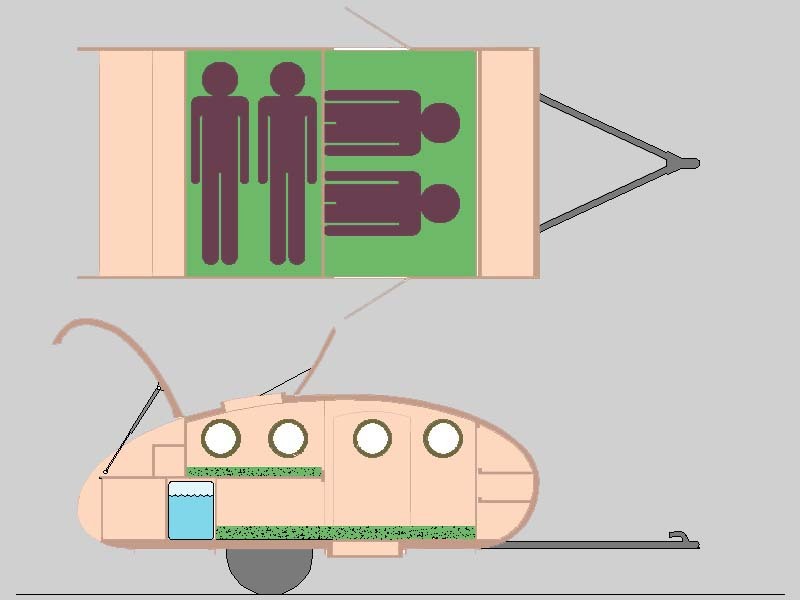 This trailer design aims to do that. It seems pointless to build a trailer to accommodate your children and then have them outgrow their berths in height before they do so in attitude. So the children's bunk on this design is sized to accommodate children up to teenage years. By then it would be a tight squeeze on height but, hey, children are adaptable. The children sleep across the trailer on an elevated bunk (with a detachable safety rail), while the adults sleep lengthways with their feet under the children's bunk. 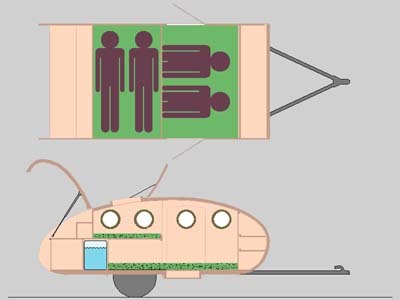 The trailer body is 12ft x 6ft x 4ft, and its profile is loosely based on the Cub/Modernistic. 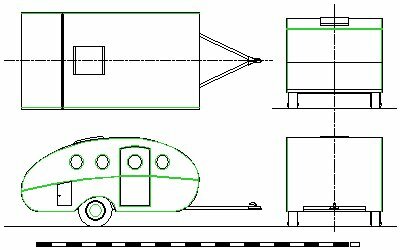 The trailer width is determined not so much by the length of the children's bunk, but by the width of the adult's bunk between the wheelarches - if the body is any less than 6ft wide overall, this bunk will be less than 4ft wide for 40% of its length. The curved body gives space for a generous closet in front of the adult's berth and a really spacious kitchen - a big cooler fits lengthwise on runners and leaves loads of cabinet space. There is room for a generous utility compartment forward of the kitchen which can house a 12gal water tank and 12v battery and still have space left over for an A/C unit or furnace. A dropped floor well has been included and part of the children's bunk can be hinged down to create two facing settees - in a 4ft body height this is not a spacious arrangement but will probably be welcome on cold or wet days. A simple chassis, based on the Wild Goose design, is used with square section longitudinals and angle transverses. The design is shown with a Dexter torsion axle, but could use a dropped axle on leaf springs. To make this design as appealing to children as possible, their sleeping area is made into a very small cabin of their own. Each child gets their own porthole to look out of from their bunk with deadlights that hinge down from the roof instead of curtains (left), there's a large roof hatch for both ventilation and emergency use and under each end of the bunk are secret storage compartments over the wheelarches for that secret stash of catapults, boy band magazines, spiders, lipstick, liberated cans of beer or whatever. 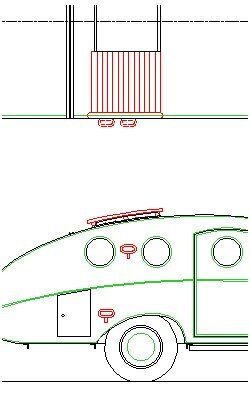 The ultimate accessory is the separate access via the roof hatch (right): this uses body-side steps (actually folding steps for yacht masts), a handrail on the roof edge and grip strips running across the roof to the hatch. Wouldn't you have killed for this as a child? Don't you owe it to your kids? 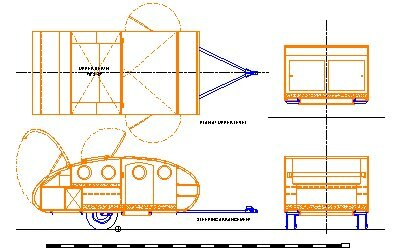 This design has been entered in the T&TTT design competition and so credit should go to one board member, Nick Taylor, for inadvertently suggesting the perfect design modification for this trailer - the split hatch and twin storage doors shown in the 'Interior 3' drawing layer below. These make the hatch smaller and lighter, and they provide convenient storage and narrow worktop space. 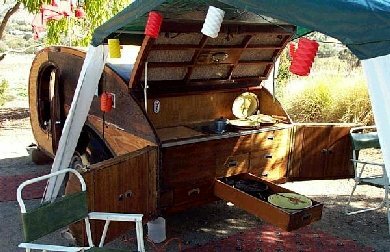 Here is a photo from Nick of this arrangement on a trailer which also has a similar transverse (single) child's bunk - there's nothing new under the sun! There is some logic to building this design at 5 feet high - getting the children's bunk and the adults' feet into 4 feet is asking a bit much, so here is an alternative version with a body 5 feet high. 2" of the extra height has been used to make a skirt that brings the body side below the frame cross-members. 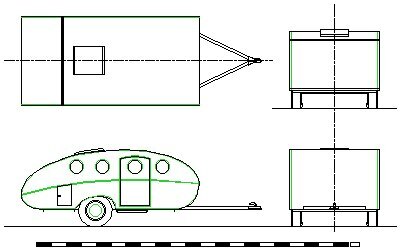 The width has also been increased to 78" to make the lower bunk an acceptable 56" between the wheel boxes - increasing the width to 78" does not seem a big problem as many tow vehicles are this size. 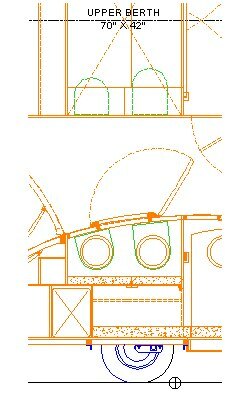 This design has been progressed to a fairly detailed level - the pdf contains most of the detail needed to build this design.